Not loving the whole, "deer in headlights" look for a portrait session? It takes a special person to be able to stare right into the lens of a camera without feeling even slightly nervous (kudos, if you are one of those people!). I have to admit, as a photographer myself, I still get a little anxious about having my photograph taken. There are a few strategies that have worked for me and my family to make a session more natural and fun! Try my 5 no fail ways to make your next portrait session even more fun than going for ice cream sundaes! Nothing is worse than standing frozen while a photographer stares at you and clicks away. Planning a simple, but fun activity to do during your portrait session makes a world of difference. When your mind and hands are occupied, you'll find that it's easier to loosen up in front of the camera. Not to mention the photographs are so much more unique than a standard "formal portrait". Try a lifestyle session where your family decorates some colourful cupcakes. (And so what if a hilarious icing fight breaks out?) Make a craft or a drawing! Even a session as simple as taking your dogs out for a walk at a favourite trail can keep the nerves at bay and makes things so much more fun! Studio sessions always have their place. I photograph newborns in my studio exclusively, however there is something liberating about getting outside to stretch your legs. If you have small children, they generally are not keen on the studio experience. And who can blame them? Little ones with ants in their pants shouldn't be expected to sit still, and parents shouldn't be expected to worry about it either. Sessions are supposed to be fun, and have no place for worry! Choose a park, your backyard or a place you can roam free during your session and you'll have so much more fun! When you're less stressed about your children acting "prim and proper" in studio, too, you'll find any anxiety you had about a photography session will melt away. Now you can focus on relaxing and having fun with your kiddos! A good photographer will be more than willing to take things outside and turn a fun evening into art! #3 - Play dress up! Props and unique clothing pieces are so much fun! Tap into your inner child and bring some unique hats, vintage scarves and statement jewelry. A parasol or colourful shoes? Think "grandma's attic"! If you have a selection of fun pieces, you may enjoy just experimenting and seeing what works. Bring it all with you in a suitcase and suddenly our session turns into a time of experimentation and creativity. High school student's LOVE these sessions and it can really help to bring out your true personality! You don't have to spend any money, either. Instead, raid a friend or family member's closet and see what you can borrow! I keep a little collection of fun hats and scarves from vintage stores, which have really come in handy! #4 - Bring your dancing shoes! Sometimes a little music is enough to add some flavor to your session. Play some music to loosen you up - or even better - bring a musical instrument if you can play! One of the first times I was photographed with my husband we brought my guitar and one of his drums. The images were just so amazing because we were comfortable holding a prop and we had our music to distract us. Even if you're not the musical type - you can bring along your cell phone with a favourite tune just to keep things light! Lawn bowling, hopscotch, hulahoop, even chess on a patio! 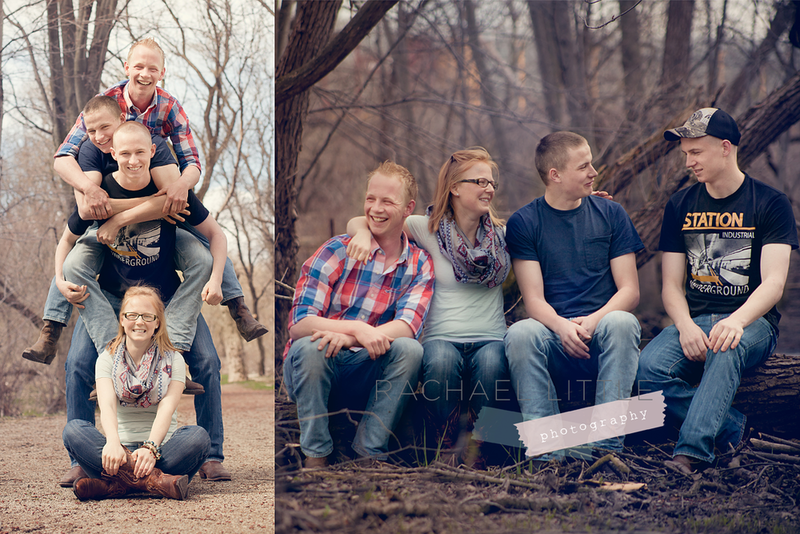 Playing a game together as a family or couple is not only fun, but will make for some great images, too! Not to mention, when's the last time you really played a board game? Bring a game of Monopoly outside, or play cards on a picnic blanket with your honey. Nothing like that competitive spirit to bring out some real expressions and a bit of laughter, too! Still need more ideas? Email me - or sign up for my newsletter! No spam - just useful tips, tricks and stories for your reading pleasure. I have many more unique session ideas and love to brainstorm on how to create amazingly unique images that fit your personality.